As I write this, NASA’s Curiosity rover is hurtling through space as it has been for the past eight months, but that all changes tonight. With any luck (scratch that — with a staggering amount of luck), that Mini Cooper-sized envoy will survive its tricky seven minute atmospheric entry, after which it will roam the Martian surface conducting a slew of science experiments for nearly two years. It’s all arguably important stuff — what Curiosity finds could be instrumental to understanding the origins of the planet, not to mention that it could help pave the way for a manned mission — but I have to wonder how many people living in this age of distraction actually give a damn. NASA, to its credit, has been doing what it can to drum up interest in the mission. There’s (curiously enough) a Twitter account for the rover, which can be seen chatting it up with Neil deGrasse Tyson and providing status updates in the first person. Oh, and the organization will be streaming the night’s events, offering up a glimpse inside the human drama of mission control. On some level though, I can’t blame those who don’t care. NASA’s recent history with Mars has been a spotty one — after a string of successful fly-bys and probe landings in the early-to-mid 70s, NASA returned to the red planet with the Pathfinder mission in 1997 (I was in third grade at the time, and utterly, utterly enthralled by the whole thing), but such incidents seem to be the exceptions. According to Reuters, 26 out of 40 Mars missions have either gone awry or gone up in (perhaps not always metaphorical) smoke — not terribly heartening odds, especially since Curiosity’s landing is going to be one of the trickiest yet. Failure, sad to say, is most definitely an option. That’s to say nothing of the fact that there’s just so much stuff going on right now. The Olympics. The mess in Syria. Tropical storms. Even decidedly niche events like the Apple v. Samsung trial weigh heavily on some people’s minds. And, you know, some people are only concerned with what’s going to be on television tonight. There’s nothing wrong with that either. There’s also a slight sexiness problem. Now, putting a man on the moon — that was something that really brought people together. If you’ll forgive me for sentimentalizing a moment I (nor many of you) weren’t a part of, that day in July 1969 pushed us all forward, if only just a little bit. Perhaps naturally, landing a car-sized robot on the surface of another planet just doesn’t seem as weighty or substantial, despite the sheer complexity of what’s involved and what it could lead to. We didn’t put our footprints on Mars. We haven’t put lives on the line. Not yet, anyway. So, yes, there are plenty of reasons why people can’t be bothered to care about rover wheeling its way around a planet that’s roughly 35 million miles away. But if you find yourself feeling a twinge of curiosity about that relatively tiny machine born of lofty ambitions, here’s why you should care about what happens tonight. First off, humanity is reaching out to plop (fine, another) something of its own creation onto another world. Just think about that for a minute. Louis C.K. has a great bit (that many of you have probably already seen, so indulge me) about how a guy he sat next to on a plane was moaning about flaky in-flight WiFi while he was encased in a streamlined metal tube powering its way through the friggin’ sky at 600 miles per hour. The point is, there’s a tendency for people to get wrapped up in the earth-bound, and it’s always nice for a change of pace. What’s more, with Curiosity, NASA’s not just reaching toward the heavens — it’s planning to learn as much as it can from them. You have to admit, there’s something more than a little wonderful about that. There’s untold value in what we can learn from Curiosity, though the information the rover is able to glean may not be immediately useful. What’s the point in learning about Mars’ past? To expand upon the corpus of human knowledge! To understand our crazy, hectic, beautiful universe even a fraction of a percent better. Even so, those findings could have a practical impact on future Mars missions, both those envisioned by NASA and those in the growing commercial space movement. Will this ridiculous landing scheme work? If it does, you can bet someone will try it again some day. Of course, not every company in that field needs the coaxing. SpaceX founder Elon Musk seems to look at Mars much in the same way — it’s a goal to be met because it’s there, waiting for us to set foot on it. And that’s just one facet of his ambitions for mankind’s space-faring future. Musk said back in March that one of his company’s ambitions was to establish a long-term colony on the red planet. His declaration smacks of hubris — all SpaceX can do now is dock with the International Space Station — but it’s exactly that sort of thinking that helps push through the myriad roadblocks that such a project would almost definitely encounter. 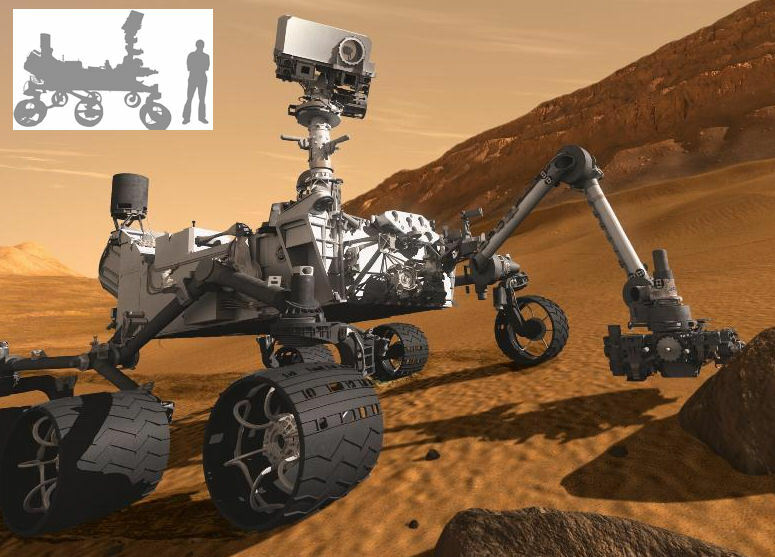 In the end, Curiosity could be the harbinger of big, big things to come. On the other hand, it could crash and burn on the Martian surface, signaling the abject loss of $2.5 billion. Either way, tell me that’s not something worth caring about.